Arthur Waagen (1869 - 1910) was born in France in 1869. He spent most of his life in Paris and exhibited at the Salon from 1861 to 1887. 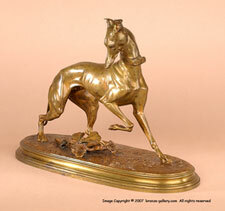 Waagen was a well respected Animalier sculptor but very little is known about his life. His most famous work is the large hunt group titled "Kabyle au Retour de la Chasse" of a North African horseman with his dogs and prey. He also created several smaller groups of Greyhounds or Whippets, one playing with a Persian Cat, another playing with a King Charles Spaniel.